I've been thinking: just for fun, let's do a Free Toy Giveaway! Getting a package of toys in the mail makes me really happy. I bet it makes you happy too. I think what the world needs right now is more people trying to help each other be happy. 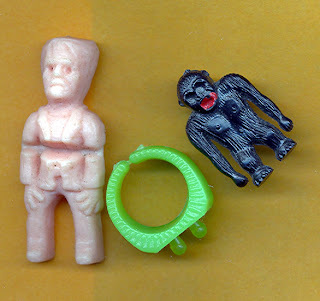 So: I've got an extra 1960s Frankenstein Monster gumball machine prize and King Kong ring available. (Seriously, how many of these things do I need? I can only wear 2 Kongs at a time, and I've got enough Frankies to start an army and take over a small town.) 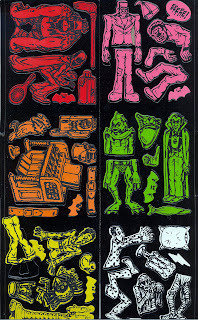 Scroll down a few posts for details on these guys, if you're wondering what the heck they are. If they appeal to you, send me a comment and tell me why you like/need them. Think of it as an adoption screening. 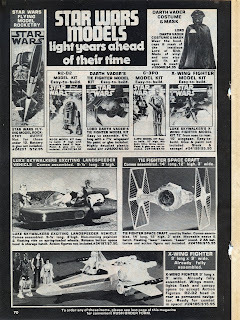 (Please, no dealers looking to resell: my faith in the intrinsic goodness of humanity is wobbly, at best, and seeing these things for sale on ebay next week would really shatter it. Dealers who want to give them a happy home at their own house are fine, though.) Don't put your address in your comment unless you're okay with me posting it: when I announce the winner, you can send me another comment with your address, and I won't post that one. There are no strings at all, just a few caveats: any toy giveaways are meant for adults only, as vintage toys can sometimes be dangerous for small children. Who knows how many kiddies choked on these Frankies back in the day...Also, I'm going to limit these giveaways to United States addresses only. Postage, customs, etc. etc., you know. Speaking of which: I'll pay the postage, so no worries there. I'll take comments through Saturday and pick a winner at random from all the ones I like on Sunday. Good luck! 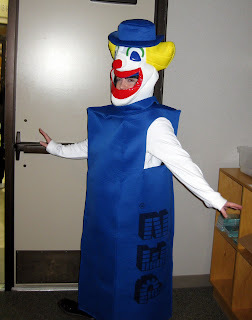 *UPDATE: 10/11/09: We Have a Winner! Morgan from Missouri is the winner, and here's her entry: "i would LOVELOVELOVE one of those little frankenthings because they are cutecuteCUTE and because i work at a library and just decorated the children's area yesterday AND because i love mail and love sending mail myself!" Morgan: I'll get these in the mail to you later this week. Hope you like them! Watch for another free toy giveaway in December! 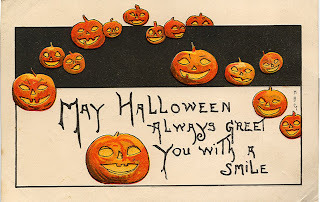 We're now in my favorite month of the year, so I'll be highlighting some of my favorite collections: spooky dolls, antique Halloween postcards and paraphernalia, and monster games and toys. To start things off, here are some fantastic primitive/folk art dolls handmade by my friend Jane, who sells her work under the clever byline, "Nothing Plain By Jane." And plain they are not: her dolls are quirky, funny, weird and wonderful. There's LOTS more dolls, but I'll finish up for now with a view of the Pumpkin Head Doll Patch, which covers the antique oak dresser in my bedroom (there's also a Pear Head Guy and a Melon Head Lady who sneaked in). Ah, Weebles, a favorite toy of my 1970s childhood. 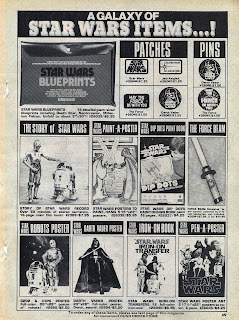 Seemed like we always had a weeble or two in our pockets back then. Remember their ad jingle: "Weebles wobble, but they don't fall down!"? 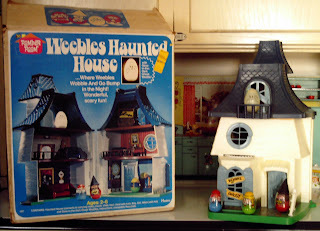 Here's one of the most-sought Weeble sets, the Haunted House, just in time for Halloween. 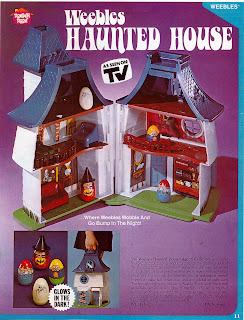 It originally came with a boy and girl with "scared" faces, a glow-in-the-dark ghost (still glows 40 years later! 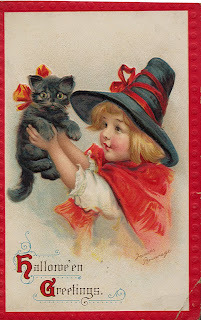 ), and a witch with a removeable hat (usually lost and now very hard-to-find). 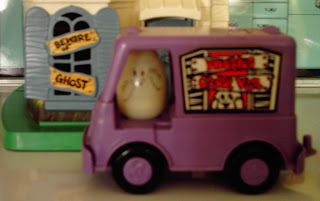 Another great Halloweeny Weebles item was the purple Weebles Ghost Van. It's unclear whether it's a van for catching ghosts, or if it's a vehicle meant for ghosts to drive. The marketing storyline on this one was vague. Speaking of marketing, though, I'll finish this post with a vintage ad for the Weebles Haunted House. Enjoy! 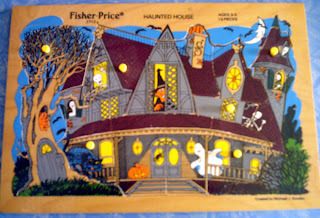 Great graphics on this 1980s Fisher Price haunted house puzzle. For a haunted house, it looks very inviting! 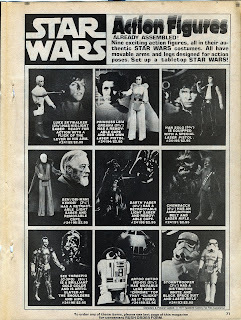 I was flipping through one of my old copies of Famous Monsters of Filmland last night (the May 1978 issue) and found this Star Wars toy advertising insert at the back. 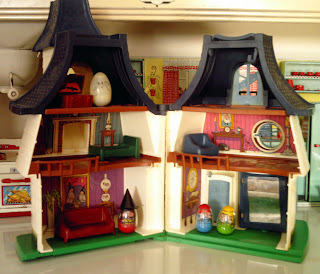 How cool to see these much-loved toys of my childhood in what were surely some of their earliest ad appearances! Click on the pics for more details. "LOOK! 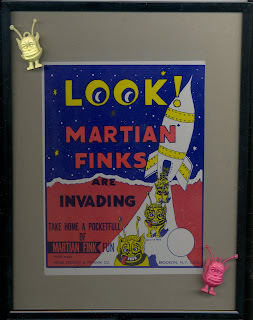 MARTIAN FINKS ARE INVADING!" This was such a great gumball machine display card that I framed it. Who could resist its call to "take home a pocketful of Martian Fink Fun"? I have two so far. Martian Finks were inspired by Rat Fink, the hot rod mascot of the 1950s and 60s craze, but in my opinion they're much cuter. 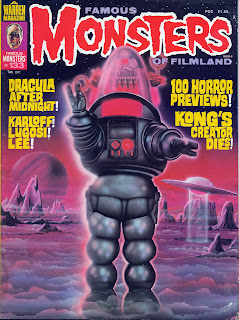 Here's one of my favorite issues of Famous Monsters Of Filmland, from April 1977, featuring Robby the Robot. Just a fab cover! 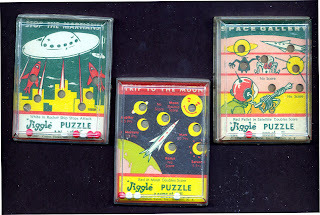 Here's a fun trio of games from my collection, all dating from 1957 and made by Comon Tatar, Inc. The first one is called "Stop the Martians!" and features a classic flying saucer buzzing a city. The second is "Trip to the Moon", and the last is my favorite: "Space Gallery," with fantastic graphics of a spaceman, ray gun, Sputnik-style satellite, and a monstrous, many-tentacled alien. 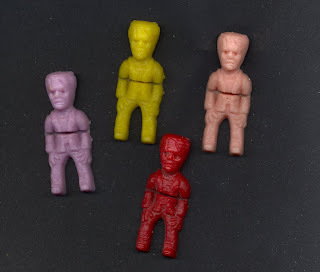 These little 2 inch tall Frankenstein Monsters are 1960s gumball machine prizes. 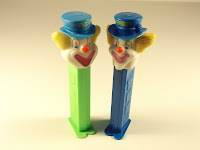 They came folded in half inside their plastic capsules (the line visible across their midsection is actually a hinge). They're a great size to carry around in your pocket and have handy in case you ever need a monster while you're out and about. 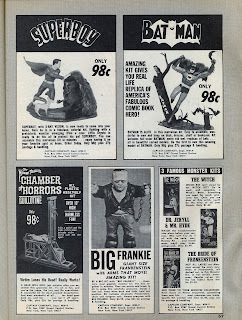 I love looking at the old ads in vintage comics and monster magazines. 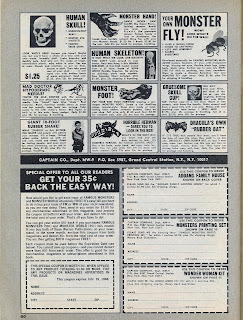 So many treasures to be had for such small amounts of money...Why, you could order your own live squirrel monkey from Monster World magazine in 1966! The ad claims the monkey will be "almost a member of the family soon after you get" it. (Hmmm. Wonder how many 1960s moms felt that way when their son's monkey arrived with the daily mail?) 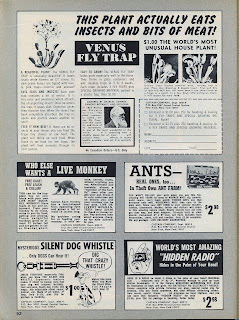 If a live critter was too much, other ads offered 10 foot rubber snakes for only $1.98, and promised that "people will admire your courage" when they see it wrapped around you. 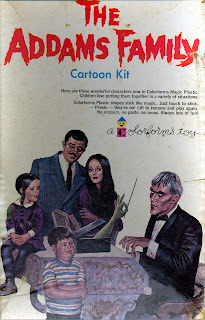 If crafts were more to your taste, a mere .98 would get you "Madame Tussaud's Chamber of Horrors Guillotine" model which, in a seemingly incompatible pair of testimonials, claimed both to "really work" and provide "harmless fun!" 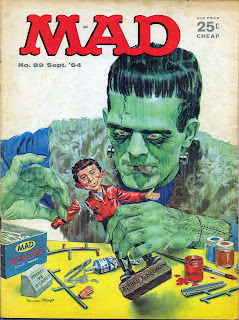 I have a small collection of vintage "monster magazines" from the 1960s and 1970s. 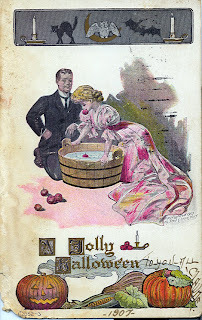 They're loads of fun to read, especially the old ads. 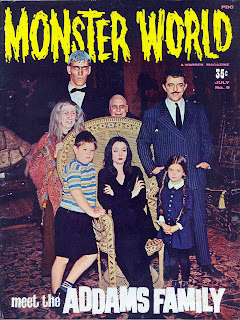 Here's one of my favorites: the July 1966 issue of Monster World, with a feature article about the Addams Family tv show. 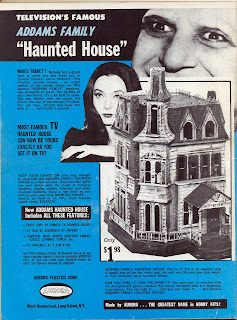 The back cover has a fabulous ad for the Addams Family model house that you could order for only $1.98! 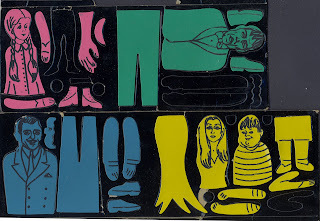 Here's a Halloween themed dexterity puzzle from my collection (click on the "dexterity puzzle" label at the bottom of this post to see some more). 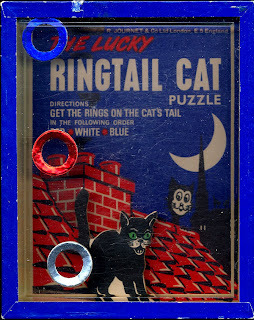 You have to ring the black cat's tail in the order specified to win. I can attest that it's really, really hard! 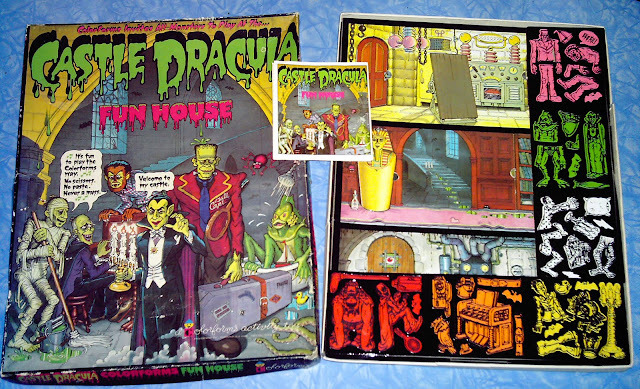 If I had to choose one vintage board game as my most favorite of all time, this would be it: the classic Disney Haunted Mansion Game made by Lakeside in the 1970s. 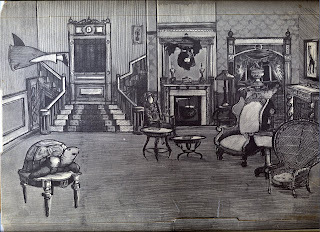 Based on the beloved attraction at Walt Disney World, the game beautifully recreated its scenes and specters. I had this game as a child, and my sister, cousins, and I played it over and over, until the game literally disintegrated. Last year, I finally decided my nostalgic yearning was strong enough to justify paying the steep asking price for a decent example. Now, we play it again, but very, very carefully! Here's one of my favorite toys for Halloween-time: a wooden Casper the Ghost musical pull toy made by the American Pre-School Toy Company around 1962. Great graphics cover the base of the xylophone, which Casper plays as he's pulled along. I love this toy! 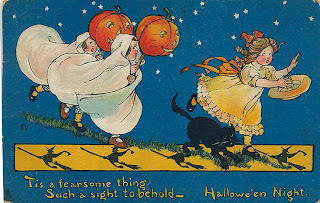 I've been fortunate enough to find some beautiful antique Halloween postcards at reasonable prices. These all date between 1907 and 1914. My favorite is the first one, with all the jack o' lanterns. 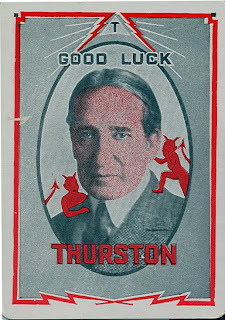 The message on the back of the blue card, penned by an aunt to her little niece in 1914, reads, "I hope the goblins don't get you!" 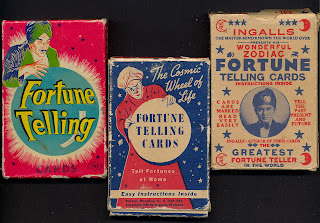 Here are some of my favorite antique fortune telling games. 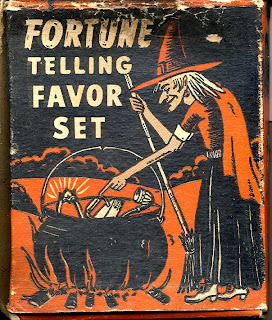 The first two are Halloween themed, with a great design of a witch and her cauldron, and date to the 1940s. (spinsterhood); a baby (that's an obvious one); and several more. 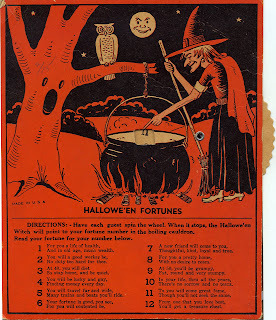 The large witch game of "Hallowe'en Fortunes" is a simple spinner fortune teller. You spin the wheel, and the number that shows up in the cauldron matches a fortune printed below. 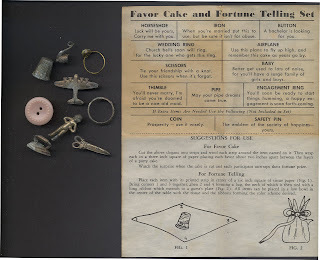 I tested it this morning, spun the number 6, and it said: "Your fortune is good, you see, For you will contented be." Whew! Glad I didn't get 9: "At 50, you'll be grumpy, fat, round and very stumpy." 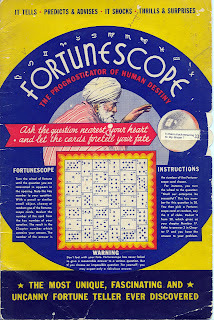 The last game has a very ponderous title: "Fortunescope: The Prognosticator of Human Destiny." It's another spinner type, and was printed in 1935. I love the graphics on this one, of a mysterious swami and his crystal ball. 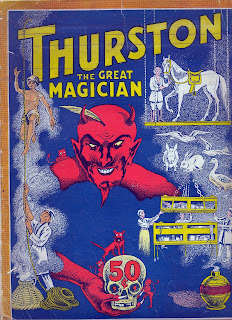 I love vintage magic stuff, and Howard Thurston is one of my favorite magicians to collect. 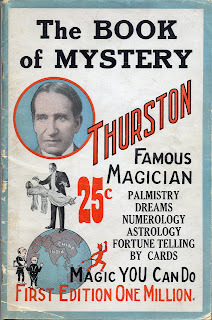 Here are one of his cards, a magic and fortune telling book you could order from him, and a program from one of his shows. They all date from the late 1920s - early 1930s. 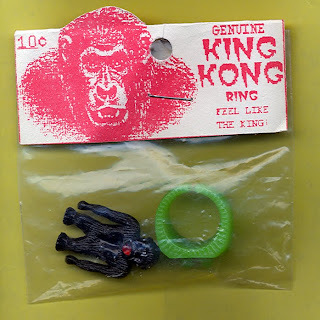 I felt I h ad found a treasure with this great vintage 1960s King Kong ring in its original packaging. 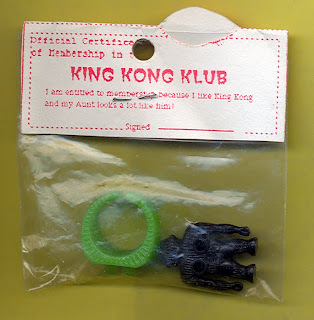 The back of the package features a cut-out membership certificate for the official King Kong Klub, with the club's creed, which reads: "I am entitled to membership because I like King Kong and my Aunt looks a lot like him!" Probably from the early 1960s, this vintage vending machine display card is one of my favorites. It reads: "Monsters...HEADS. GHOSTLY! HEY KIDS: They stick on your head!" And indeed they do: the tiny monster heads are still sticky after all these years. 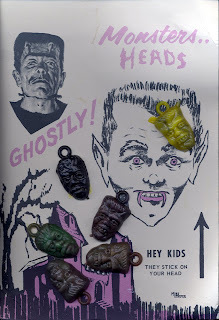 Or, you can string them on a necklace for a fabulously ghoulish fashion accessory.